After the Arcade Fire/LCD Soundsystem pairing, this might be the next best tour of the year. 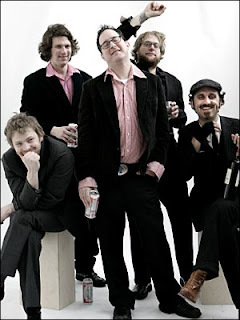 The Hold Steady are coming back through Lawrence after playing an amazing (and poorly attended) concert at the Bottleneck last December. Their last album, Boys & Girls In America, was my number two album of the year for 2006. 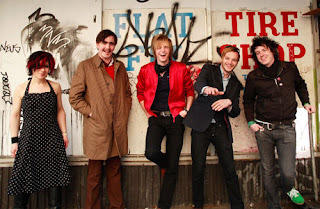 They are joined by Art Brut who just released their second album, It's A Bit Complicated. I've never seen Art Brut live but on record singer Eddie Argos is one of the few front men that can rival The Hold Steady's Craig Finn as far as lyrical cleverness and humor goes. If you like Rock 'N Roll, don't miss this show. That album at the Bottleneck was poorly attended? WOW? Insane! Have fun. It's going to be an awesome show in a good venue. Meant to type concert and not album. Good work by me. yeah, it was a pretty disappointing showing, i'd say about half full. Especially considering that bands like Of Montreal, Cold War Kids, and Explosions in the Sky sold the place out long before the show date.